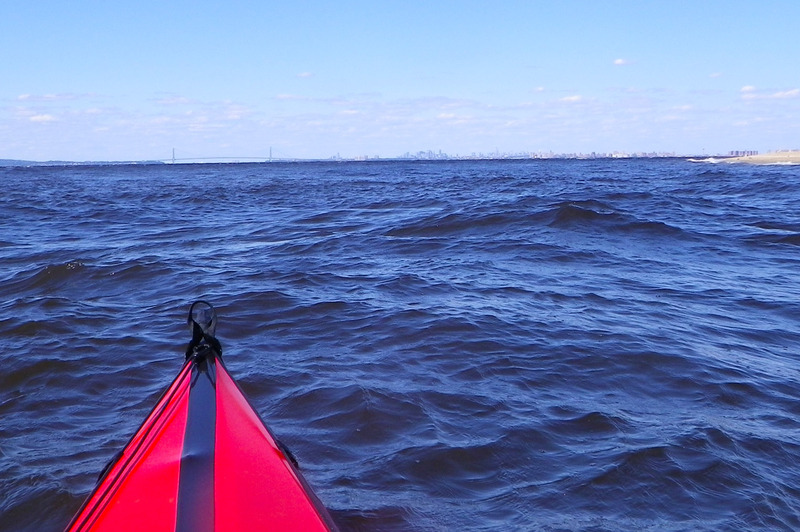 Sandy Hook, NJ, a long thin finger that reaches out across the Lower Bay toward New York City, is an irresistible destination for a kayak trip from the city. 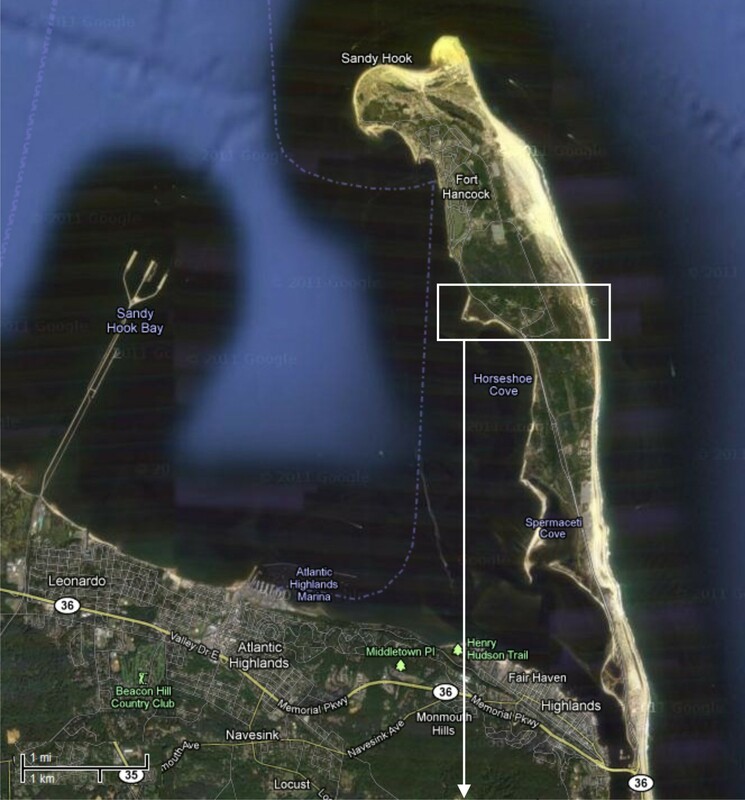 But once Sandy Hook is off the bow, where to land? The perfect landing site can be elusive. 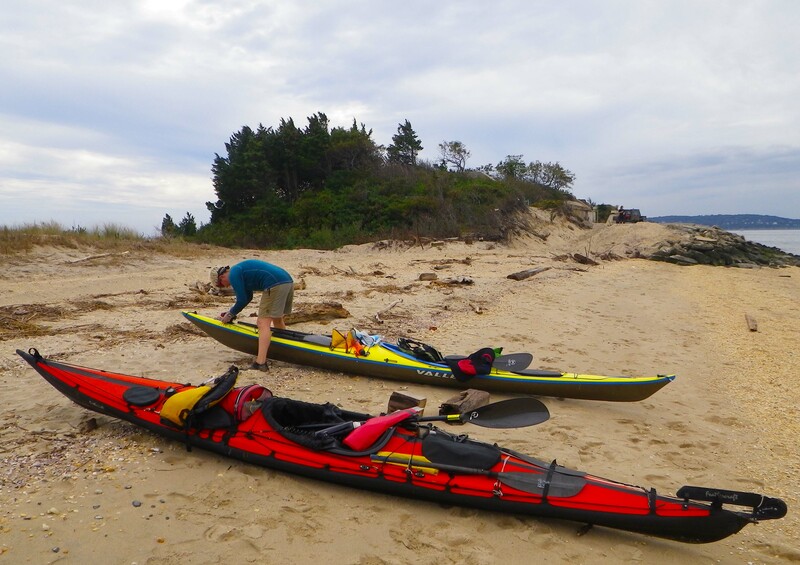 Landing is nowhere actually difficult on Sandy Hook—there is a broad sandy beach almost all the way around (although the ocean side can have significant surf). But in most places it’s a featureless beach, offering no shade in the summer nor shelter from the wind in the winter. Parts of the beach may be off-limits for one reason or another. And besides, we want to have lunch in a picturesque spot, rich both in local sights and sounds and views of the landscape. 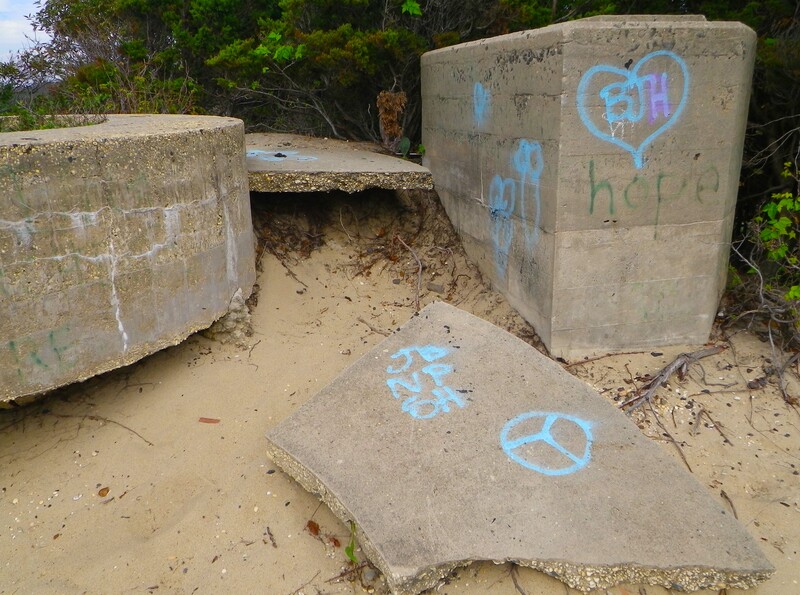 There is such a spot on Sandy Hook. 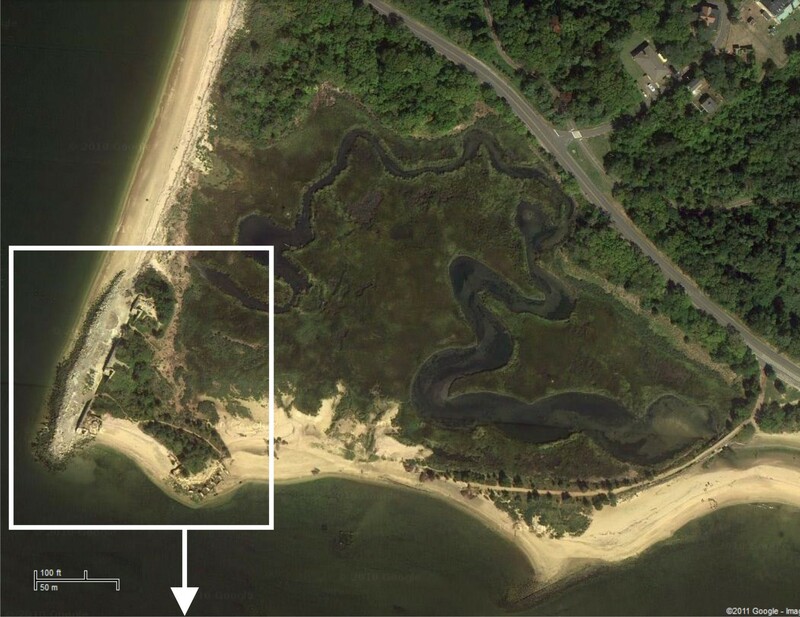 A mile and a half down the bay side, right on the beach, there is an overgrown hillock—almost a little island, no more than a few hundred feet across, that is cut off from the rest of Sandy Hook by a salt marsh that floods at high tide. 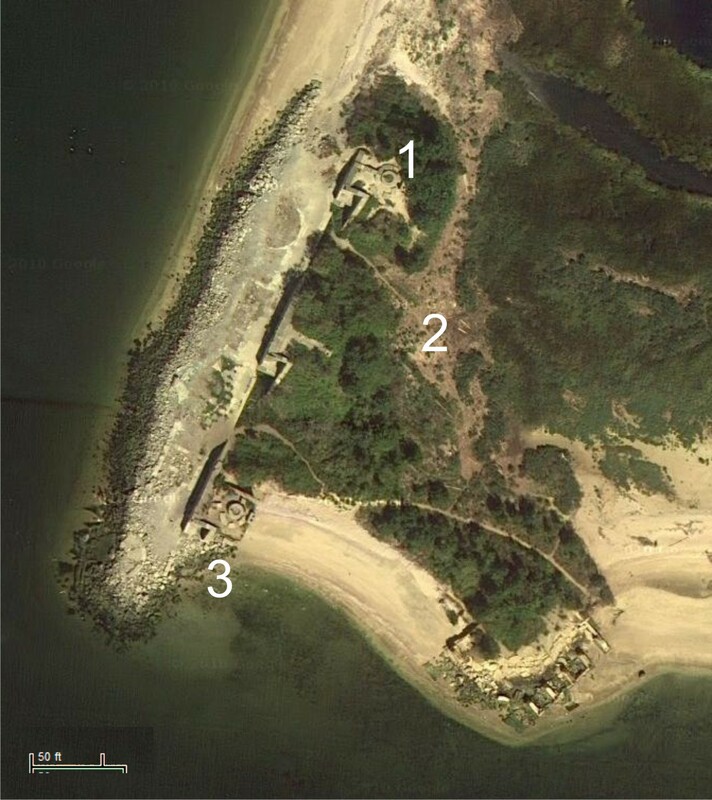 That’s where we like to land on Sandy Hook. 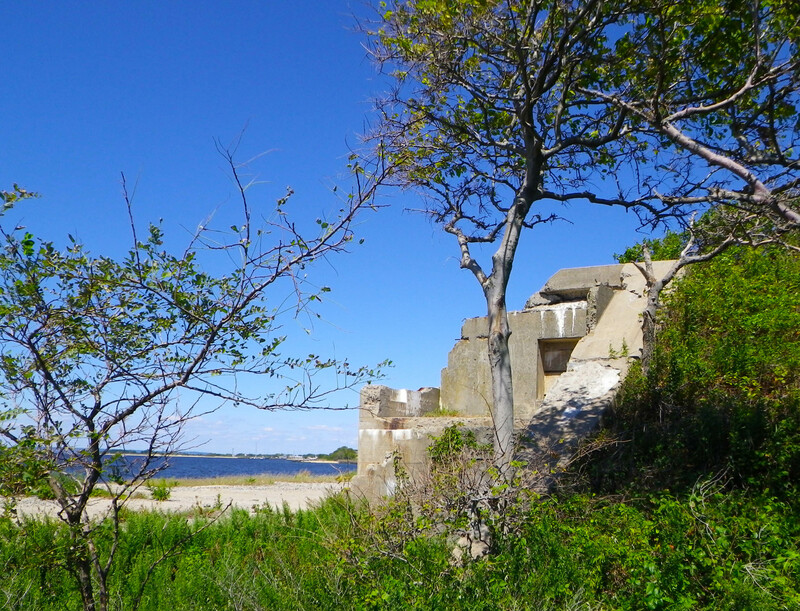 The hillock is actually the crumbling, overgrown ruin of a military installation, a series of concrete blockhouses topped by circular structures that may have been gun emplacements, that probably dates back to the 1950s or 1960s, when Sandy Hook was the site of a Nike missile battery guarding New York City, or even further back into Sandy Hook’s long military history. The concrete is crumbling more year by year, and the circular emplacements make perfect planters for growths of prickly pear cactus.. 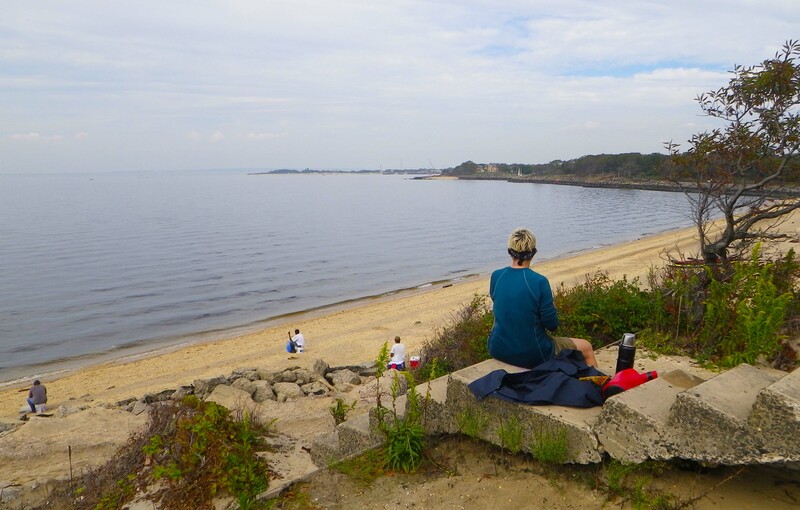 But the elevation offers a lunch spot with great views north toward the tip of Sandy Hook and out over Sandy Hook Bay. 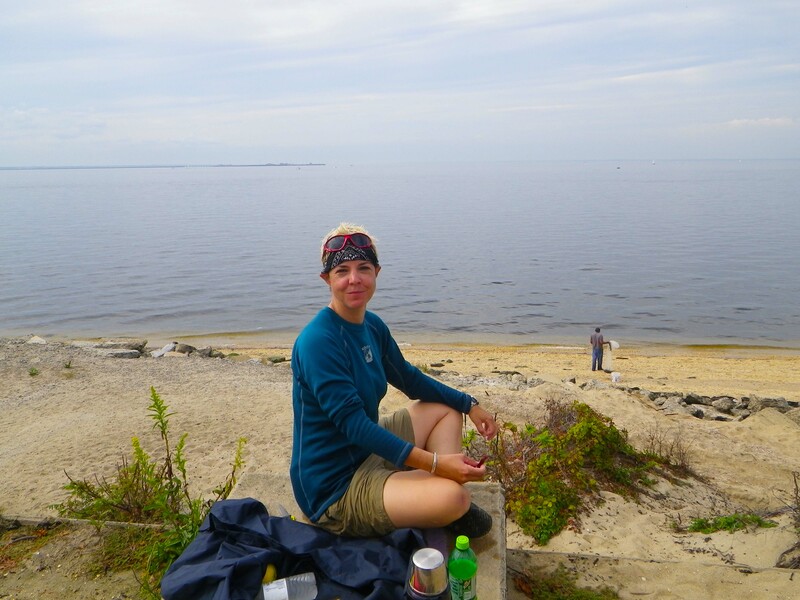 On our last trip to Sandy Hook, these three fishermen were fishing with weighted nets off the beach—or rather, were staring at the water waiting for fish. 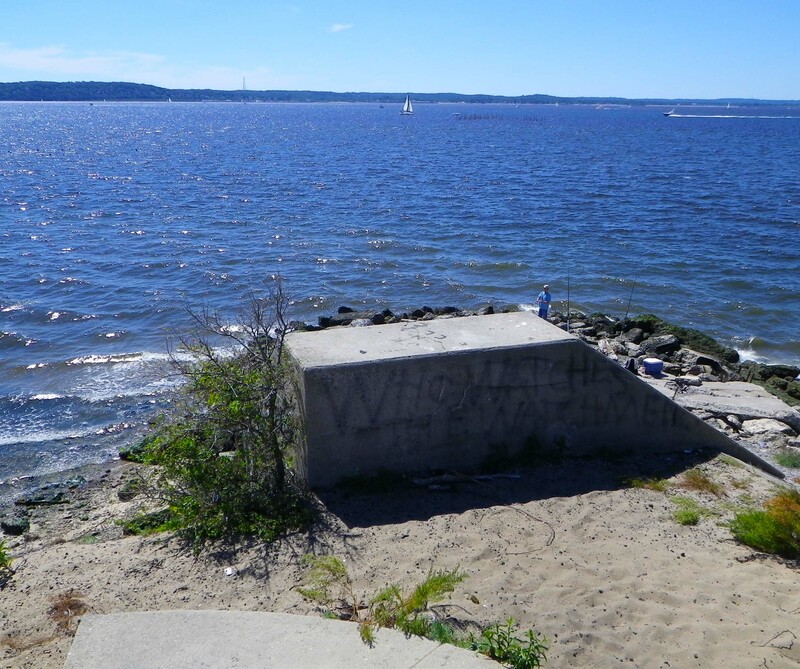 Although Sandy Hook Bay abounded with schools of small fish that day, they evidently stayed just too far out of reach, and eventually the men walked away disappointed. On the landward side of the little hillock is a miniature forest crisscrossed by sandy paths, a haven for Monarch butterflies. 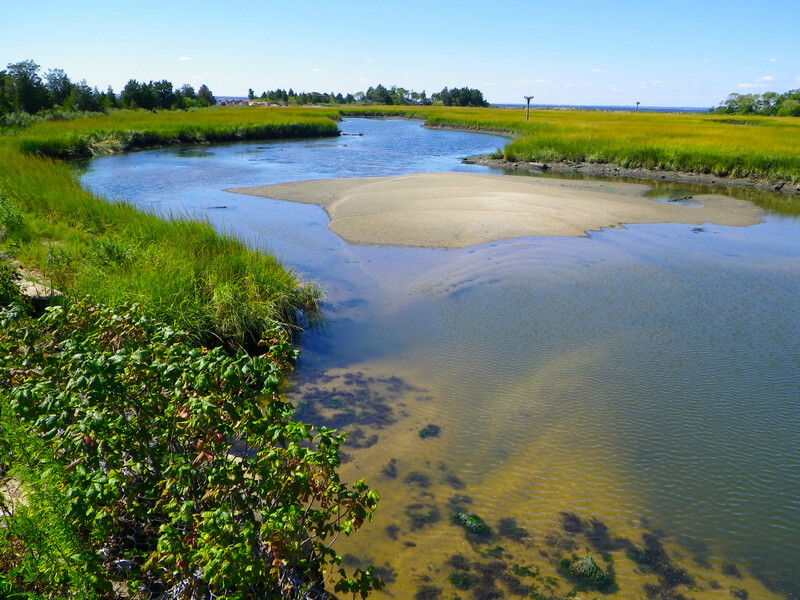 And beyond that, the salt marsh. 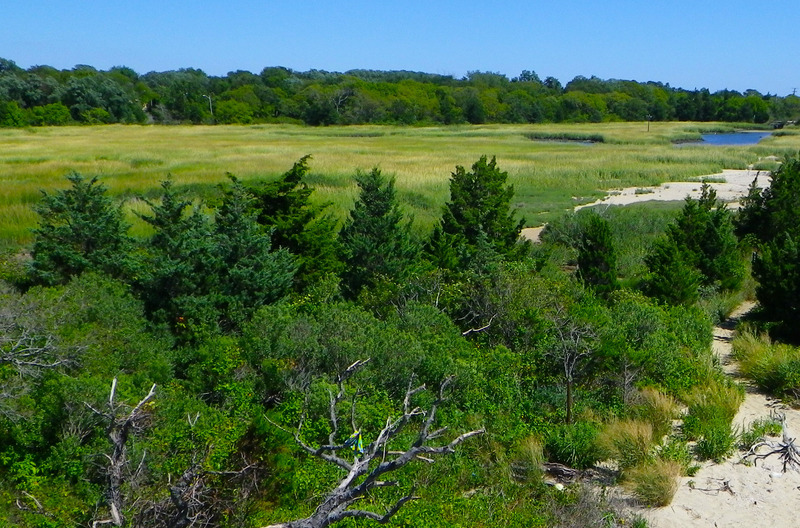 In the salt marsh, looking back at the "island"
Panoramic view of perhaps 230 degrees, stitched together in Photoshop, from the top of emplacement "3". 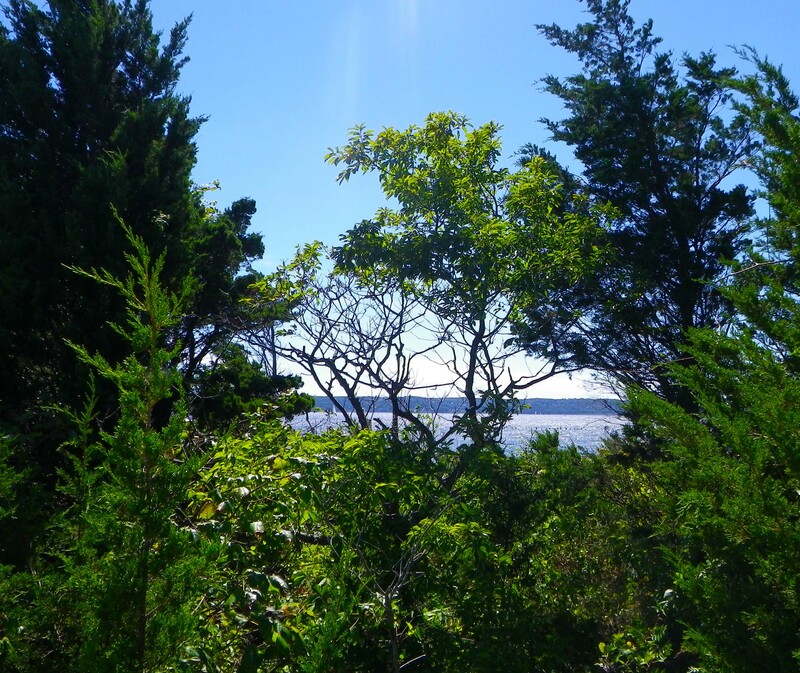 On the left is the Sandy Hook shoreline north toward the tip of Sandy Hook, on the right the shoreline south toward Highlands and the entrance to the Navesink and Shrewsbury Rivers. After lunch at this idyllic spot, we are refreshed, re-energized, and ready to head across the Lower Bay back to the city! All these and other photos from Sandy Hook are here and here. 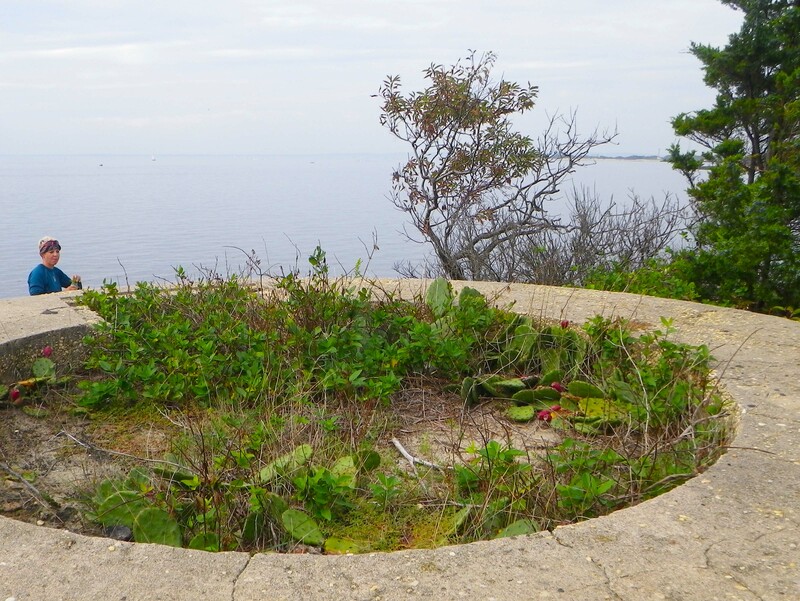 This entry was posted in Kayaking, Nature and tagged Fiddler Crabs, Kayaking, Military Ruins, New York Harbor, Prickly Pear Cactus, Salt Marsh, Sandy Hook, Satellite Images. Bookmark the permalink. Can’t wait to check out this great little spot one day. Thanks for sharing! You are welcome, Reid! Highly recommended!